The veriest school of peace. And yet the fool contends that God is not. What? Not God in gardens when the eve is cool? Nay, but I have the sign. ‘Tis very true God walks in mine. I have never forgotten these lines from a poem I learned in elementary school. Why? Because they paint a vivid pen-picture of a garden. I also received my first ever prize for Composition in the third grade when I wrote an essay entitled “My Garden”. Needless to say, since I lived in an apartment at the time, my essay, like the garden it described, was created entirely out of my imagination. When I did get the opportunity to create a garden of my own, I went to it with a passion, collaborating with Llew who shares my great devotion to the soil. 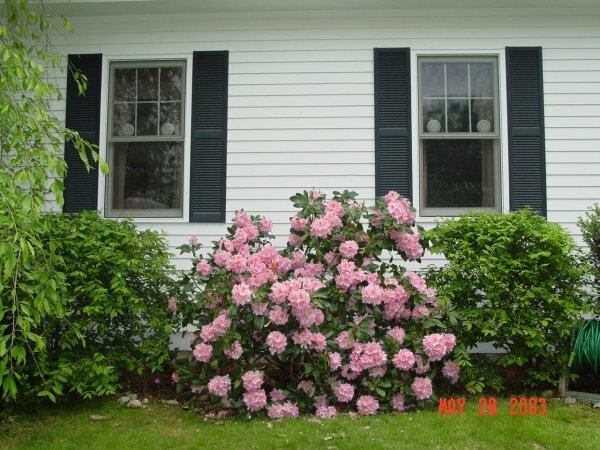 The picture above captures the baby pink rhododendrons that bloom between the windows of our living room every May just in time for Llew’s birthday–Nature’s gift to him for tending so carefully to our garden all year round. The picture above is taken from the back of our garden. It presents a rear view of our home and shows part of the hydrangea bushes in full bloom in the middle of summer. I inherited my love of gardening from my Mother Edith who established a container garden in her home in Bombay, India, nearly thirty years ago. 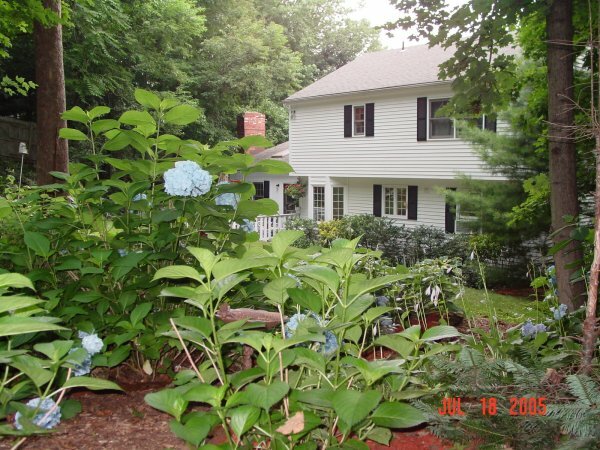 My opportunity to try my hand at serious gardening presented itself when we moved to our present home in Southport, Connecticut, in the summer of 1996. It was love at first sight, both of our charming little sailing village and of the home we currently occupy which I subsequently named Holly Berry House–as a tribute to the twin holly bushes that flank the front door. Our house sits almost in the middle of a quarter acre of property which abutts the woods at the back making it completely naturalized. While we loved the mature trees that encircle our lawn, we inherited nothing but a weed-ridden back lot when we first bought the place. It has taken about eight years for our garden to take shape and, today, we can say with much gratification, that we actually have a garden, not just a backyard. Llew and I invested much sweat equity into the creation of our garden believing in the old adage that “He who plants a garden, creates life”. Indeed, that is what we seem to have done in our garden which has become home to a variety of wild life, not all of them completely welcome! For instance, we could do well without the visits of the deer family who troop in to snack on our daylily buds just before they burst into bloom. Can you think of anything more frustrating to a gardener? Yet, we realize that we have taken over the habitat of the wild creatures that once called these woodlands home. We have to stop, at times of resentment of their presence, to remember that it is we who are encroaching on their land and not vice versa. The bunnies and the chipmunk are always a delight to watch and we enjoy their antics as much as we enjoy the scores of fat squirrels who try every trick in the book to raid the bird-feeder to eat the bird seed that we put out to attract a wide variety of our feathered friends from boring grey doves to vivid red cardinals, noisy bluejays, chirping chickadees, bossy blackbirds, and garish woodpeckers. We’ve even installed a bird condo in our garden and have had the pleasure of seeing house wrens and chickadees nest in them, feed their hungry young at the peepholes, then take wing when they were ready to fly out and greet the world. Daylilies, hostas, astilbes and Nikko Blue hydrangeas are the mainstay of our garden. I have propagated hydrangeas from cuttings and have distributed them all over our flower beds. They put on a jolly show of blue mopheads all summer long. Every spring, we divide our hostas so that we have double rows of them all over the flower beds. Autumn Joy Sedum is another favorite that never seems to need any care. While we’ve planted mainly perennial shrubs, bushes and flowers in our garden in order to keep maintenance low, we also plant a number of annuals in terracotta pots on our deck to bring in fabulous seasonal color. Petunias, geraniums, dahlias and bizzie-lizzies (impatiens) proliferate on our deck all summer long and keep company with the herbs that I plant every season so we can enjoy parsley, sage, rosemary, thyme, and mint right at our own back door. Apart from having living things in our garden, we have interspersed the plantings with loads of statuary. A few years ago, my daughter Chriselle, presented me with a set of rare antique German majolica gnomes that she spied in a tiny store in Munster, Germany. With the greatest difficulty, she hand carried them tenderly across the Atlantic to me. These beauties summer in our flower-beds and winter on the mantlepiece in our family room. There are also stone and concrete statues, ceramic and iron birdbaths and other objects of interest in our garden. We love our garden though it calls for an enormous amount of work and dedication. A garden is an on-going project. We have realized that it is never completely done. There are always weeds to be plucked out, beds to be watered and mulched, new species to be tried and tested. But since we tend to do most of our gardening together–(Llew does the heavy duty work like the raking, the mowing, the digging, while I do the more aesthetic things such as planning plantings, weeding, mulching, watering, etc. ), we don’t find these chores a burden. One of my greatest sources of pride is the brick pathway that I laid out at the back entirely on my own. I was taking a walk to the beach, one summer morning, three years ago, when I saw a pile of old bricks tossed out on the sidewalk along Pequot Avenue. It seemed to me as if a very old front patio was being pulled out to make way for new lawn. I did not hesitate to ring the owner’s doorbell and inquire about the bricks. Cheryl Guibone, who answered the door, told me that I could have them as her new front garden was being designed. It did not include a brick patio. I could not believe my stroke of luck as old brick is extremely expensive and hard to find. I remember losing no time in putting my car through several trips during which I placed the bricks in the trunk and transported them directly to the back garden where I started to lay out a pathway using the bricks to define smaller flower beds. The next day, my arms felt ready to fall off their sockets! But the aches and pains were not in vain. The brick pathways make the back garden far more manageable and created spaces through which we could walk. Later on, we used red cedar mulch to define those pathways. As the years have gone by, we have filled in those flower beds with lush plantings. And we’re not done yet…there is still one large flower bed that is bare and will receive our attention later when we will transplant some more hosta and yellow loosestrife, Autumn Joy sedum and ferns into that still untouched area. It is still incredible to me that coming as we did from a tropical part of the world and having no knowledge of how perennial gardens in the temperate zone work, we were able to learn enough about gardening in America from scratch to create this garden. To me, it is a unending miracle of Nature and I still can’t get over the manner in which all vegetation disappears into the ground in the fall only to return again in remarkable guise when spring arrives. This yearly cycle of the seasons offers me an opportunity to reflect upon the possibilities of periodic renewal in our lives. As my favorite poet John Keats put it, “A thing of beauty is a joy forever” and our garden constantly enraptures us. Won’t you spend a few moments taking a look at the pictures of our garden as it looked in the summer of 2005?